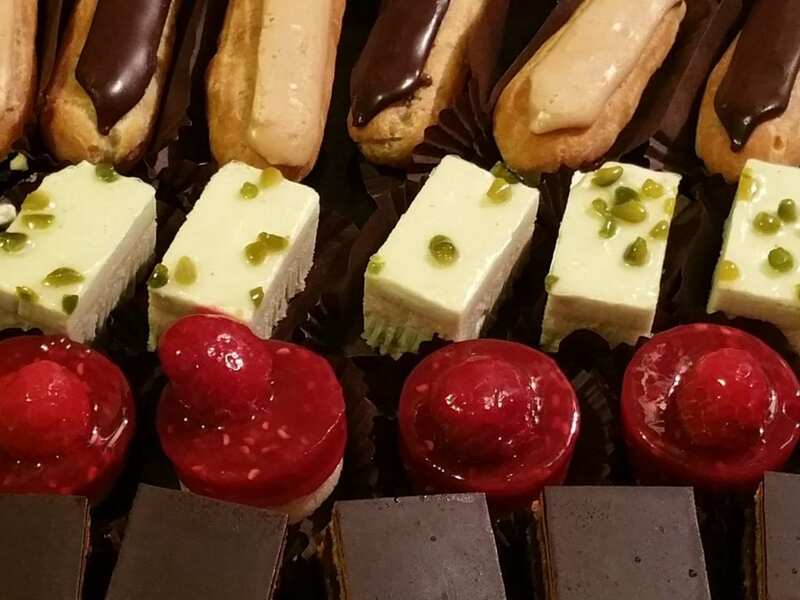 Bring a little sophistication to your party with our handmade petit fours. Our Symphonie selection is typical of classic French recipes in miniature. Tarttelettes Citron, (classic French lemon tart). 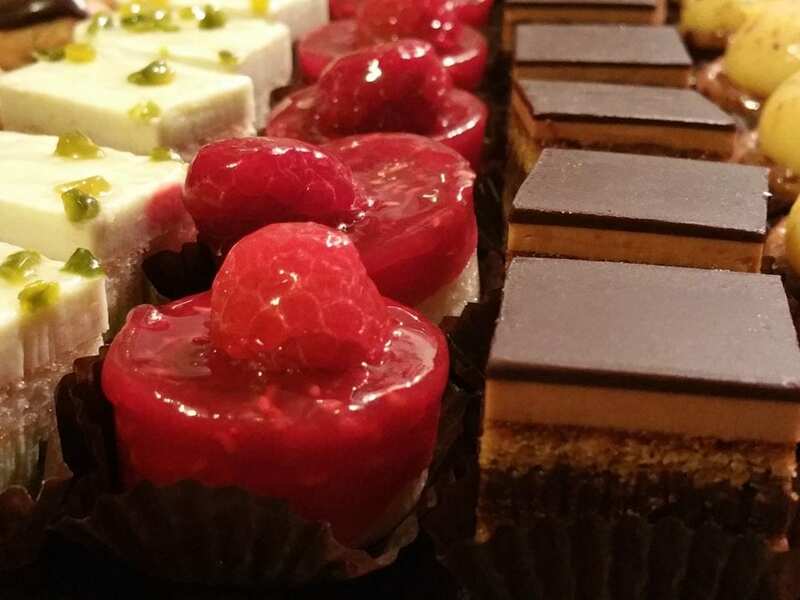 Carres Opera, (small squares of the classic French opera gateau). 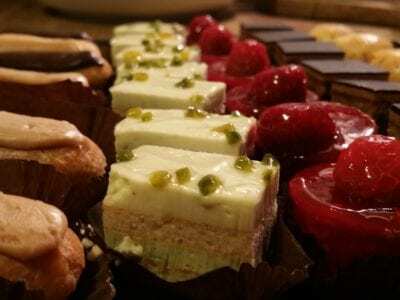 Financiers Framboise, (miniature raspberry gateau). Rectiangles Pistache, (layered pistachio gateau). Eclairs CafÃ©, (classic coffee Ã©clair). Eclairs Chocolat, ( classic chocolate Ã©clair). Carres Pomme Cassis ( small square gateau layered with apple and blackcurrant). Flans Abricot, (miniature apricot flans). Tartilettes Chocolat, (miniature chocolate tarts with crushed hazelnut). Beautifully presented miniature desserts in shot glasses. Ganache with a chocolate mousse, topped with white chocolate shavings. A delicate lemon mousse on a fine crumble base topped with a French meringue and semi confit lemon zest. Raspberry soaked biscuit topped with raspberry jelly and sabayon cream and finished with a whole raspberry and scattered crumbed pistachio. 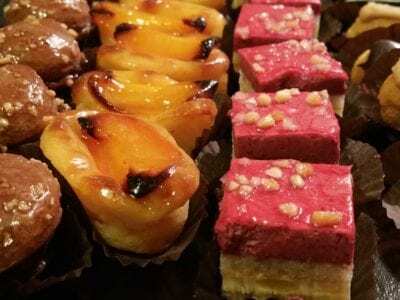 One platter consists of 4 different flavours with 9 of each flavour. A total of 36. We recommend one platter serves 8 to 9 guests. 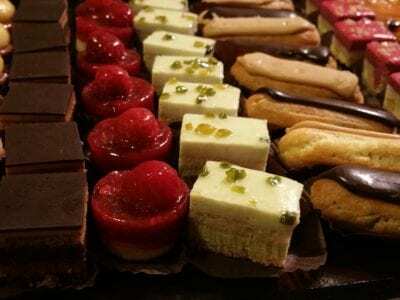 A delicious selection of typical Parisian Petit Fours. There are 8 different Petit Fours to each platter with 6 of each type. We recommend each platter serves around 12 people. £36 per platter. Les Parfumes – Almond and red berries financier cake, Mini Caramel cheesecake, Coconut, mango and passion fruit panna cotta finger, Mini praline choux pastry, Sweet chestnut and blackcurrant biscuit slice, Strawberry and raspberry tiramisu, triple chocolate carre, apricot and vanilla financier cake. A Platter of 48 Mini Choux Balls, each filled with a refreshing fruit puree. There are 6 flavours in total with 8 of each filling. The fillings are – Blackcurrant, Raspberry, Strawberry, White Peach, Passion Fruit, Lemon. 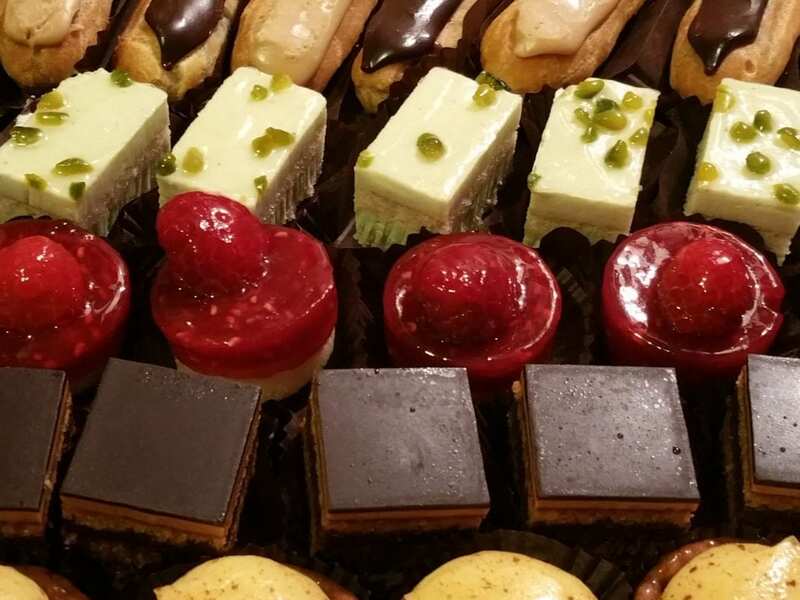 We recommend one tray serves around 12 people depending on which other Petit Fours or Desserts you are serving.